Despite having my camera break half an hour after arriving at Annapurna Base Camp, I still have truckloads of photos from the Annapurna Sanctuary Trek still to upload- and maybe a story or two as well. A. brought this photo to my attention as one of her favourites a couple of weeks back, and as she explained why she liked it, it grew on me as well. The prayer-flags among the Himalayan peaks are always a delightful scene- the colour contrast against the stark blue and white of snow and sky is dramatic. But it also captures a series of elements and dichotomies- between the man-made flags and the natural mountains; spirituality reflected both in the prayers and in the majesty of the high places; the hard rock versus the flowing flags; wind and earth; man’s efforts and God’s creative power; the list goes on. Really, each photograph is up to the individual to appreciate however, and so I shall leave you to do so. Or otherwise. Back from Tassie soon. See you shortly. My trek through Nepal was one of repeated moments that hang viscerally in my memory, and there were probably several that could have made this list, so although this is the second I’m mentioning, in a way I’m showing terrible restraint. Five days on from the photograph taken of Macchapuchare at Dawn, we found oursleves in the Annapurna Sanctuary, at the Annapurna Base Camp, sitting at 4,300m beneath the yawning face of Annapurna I. As places go, the Sanctuary is up there as in the top two or three most spectacular pieces of scenery I’ve visited anywhere. Ringed by peaks six, seven and eight thousand metres in altitude, it is staggering in scale, in drama and in wild, unrelenting beauty. Atop a cliff carved by the glacier at its feet sits a shrine (actually a chorten). It has been erected a short walk behind and above the base camp proper, on an outcrop of rock overlooking the glacier, Annapurnas I and South, Tent Peak, Macchapuchare, and a host of other peaks less well known but every bit as dramatic. 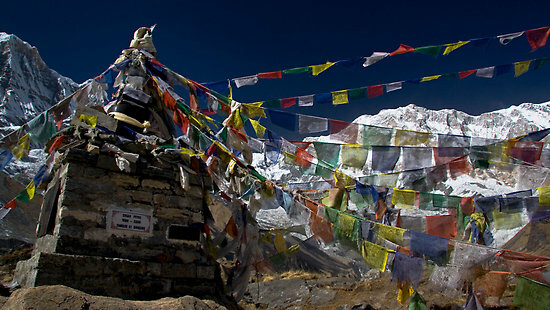 The shrine honours mountaineers who have fallen on Annapurna I. Some names are engraved on brass plaques on the side of the shrine. Others have their names on rocks placed at its base. Among the more prominent is that of Anatoli Boukreev, controversial hero of the 1996 Mt. Everest disaster, whose actions both saved lives and, argued by Jon Krakauer in his outstanding tale of that tragedy “Into Thin Air” (one of the best mountaineering books ever written in my opinion), placed them at peril. As one who loves the mountains (though I would never refer to myself as a mountaineer) I found the shrine deeply moving. A more beautiful setting for a memorial could not be imagined. Sitting there, the quiet was overwhelming. I was alone. I hung my feet over the edge of the cliff. The sun was warm but the November air was bitterly cold. A wind gusted up the valley, and the streaming prayer-flags snapped and rustled. The belief in the flags is that as the wind moves through them, the words written in prayer on the material are carried to heaven. The tips of Annapurna I and some of its companions are so high that they protrude into the jetstream, and to accompany the fine streams of ice-crystals I could see blowing from their summits, I could hear the deep roar of the high-altitude winds like the rumble of a jet’s engines. Beneath the warming gaze of the sun, ice melted and crumbled, and rocks frozen into the jagged surface of the glacier beneath me were released, where they tumbled with sharp clacks that echoed to where I sat. Far in the distance, hidden somewhere on Annapurna’s vast flanks, a giant avalanche released, an unmistakable noise that sounds like a distant train and shakes the air. It was a magnificent moment, a place that blended the sheer natural beauty of one of the world’s most spectacular landscapes, with the pathos and energy of human endeavour and its cost. It was at once sensual and spiritual, and in some way, greatly hallowed. Places like this I feel I can reach out and touch God with my soul. I don’t cry easily, but sitting for a few minutes in that place, I found tears stinging my eyes. I loved Nepal. 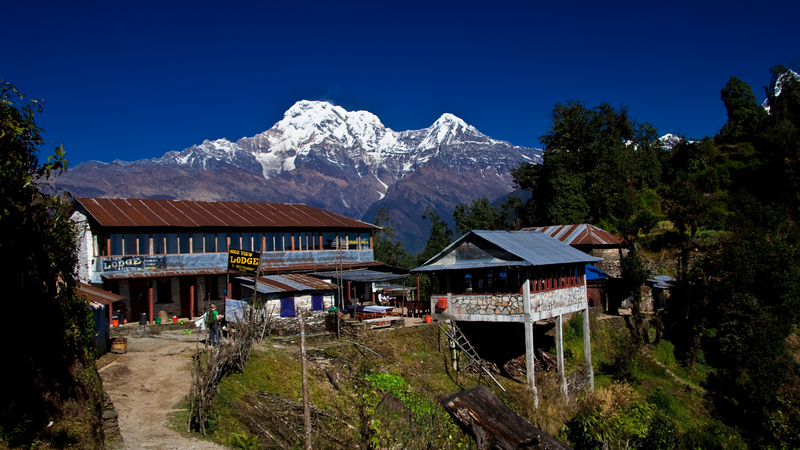 I loved the Annapurna Base Camp Trek. And I loved Annapurna I. The colourful prayer-flags that adorn sacred sites in Nepal are an unforgettable feature of that country. Photographically, they are such a gorgeous contrast with the white and blue theme of the peaks themselves that few travellers with an eye for images will forget this feature of the country in a hurry. It is one of the most vivid and colourful memories, and a cliche for photographers such as myself. Cliche, maybe, but one that works so well. I took this shot of Annapurna through the flags hanging from the shrine to fallen mountaineers above Annapurna Base Camp. The framing just worked, and I liked the contrast of scales. 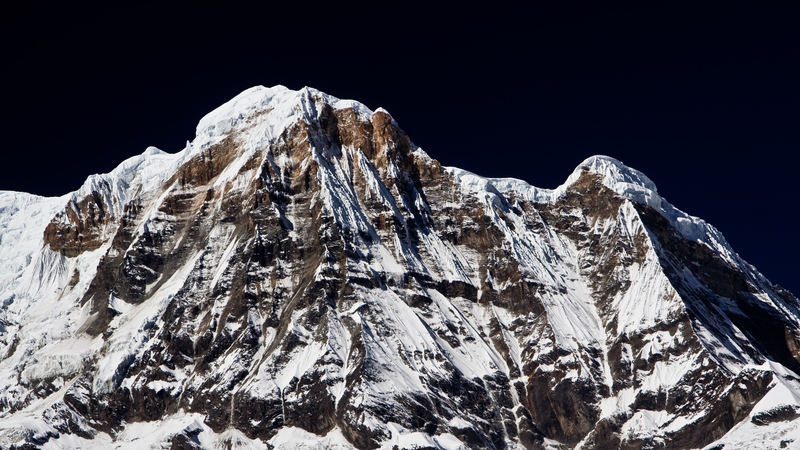 Annapurna I is gargantuan- 8,091m and the 10th highest peak in the world (albeit the first 8,000m peak to be climbed, by Maurice Herzog in 1951). The location is breaktaking, and with the strong fall sunlight, the colours just shone. I want to go back here. To take more photos. And to stand in this beautiful location and enjoy the magnificence of creation once again. 1. Magenta Morning: Machapuchare and Bougainvillea in the morning sunlight from the village of Dhampus. 2. Roof of the World: Framed behind the slate roof of a local cottage, Machapuchare and its roots tower far above the foothills north of Pokhara. 3. Fishtail in the Forest: The peak rises above sprays of rhododendron trees in the lush mild jungles on the approach to the Annapurna Sanctuary. 4. The Umbrella: Machapuchare viewed from the lawn of one of the many tea-houses early in the trek. 5. The Trail Climbs: Machapuchare reappears above blossom trees after half a day of absence following the [heartbreaking] descent and then climb from Chomrong. 6. Cairns: Offerings are laid in reverence of the sacred mountain where it is visible framed by towering rock masses above Deurali. 7. Fishtail Face: From the same angle, the twin peaks and the face that divides them show how Machapuchare got its nickname where it hangs 6,993m above the valley below. 8. In the Sanctuary: Machapuchare dominates the entrance to the Annapurna Sanctuary, with Machapuchare Base Camp nestled in the valley below its formidable face. 9. Himalayan Starlight: Machapuchare anchors the Annapurna Himal with Annapurna South, Annapurna I and Hiun Chuli to the left, and Annapurnas II and IV to the right, while startrails swirl overhead on a long-exposure night-shoot from Dhampus. Sunrise over the city of Nouakchott, the capital of Mauritania. Half as big again as the US state of Texas (slightly smaller than the Northern Territory, half as big again as the nation of the Ukraine, or roughly the same size as France and Spain combined, depending on the audience and frame of reference…), Mauritania has a population of just 3 million mostly-nomadic people. In true Sahelian fashion, it straddles the line between civilizations, with a thin southern strip home to a significant population of African ethnic groups, including the Wolof, and the rest drawn from north African groups with roots in the fairer Moorish, Berber and Tuareg peoples. Sadly, as with many similarly-divided nations, a sense of superiority aligned with the lightness of skin has developed, such that in Mauritania there are ‘white’ moors and ‘dark’ moors, the latter of whom tend to be subservient to and occupy economic positions below the former. Mauritania has the dubious reputation of being one of the last bastions of societally-condoned slavery in the world. Mauritania is a fascinating place. Much of the population is truly nomadic, and while the African agriculturalist groups have settled close to the Senegalese border (about a third of the population), and another million have begrudgingly accepted a sedentary life in the country’s nondescript capital by the sea, this leaves the final million to be finely sprinkled throughout the rest of this vast Saharan nation, with the result that it is, predominately, devoid of anything. Just vast empty expanses of desert. Another trip I will doubtless spend more time talking about in more detail is my brief stay in Nepal, trekking to the Annapurna Sanctuary. Three of the best-spent weeks of my life. The scenery was spectacular, the culture fascinating, the weather perfect, and the company pretty stellar as well. Many very, very fond memories. Among which is not the fact that my camera died forty-five minutes after arriving at the crux of the trip. Fortunately, on this morning my camera was working. 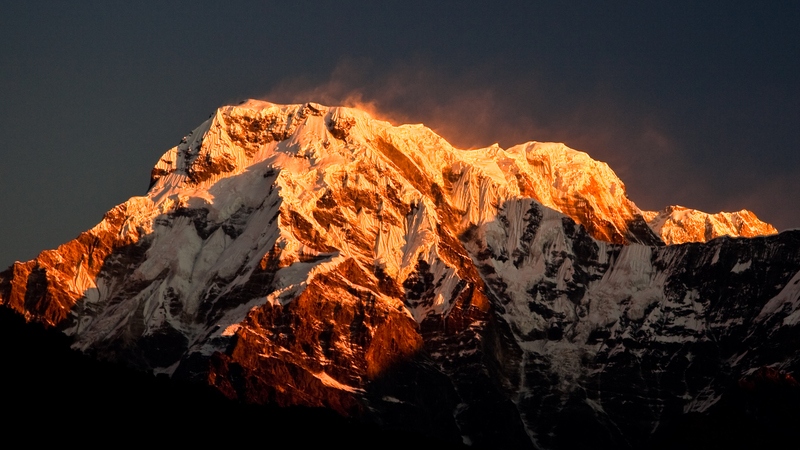 I snapped this of one corner of the enourmous Annapurna Massif, here capturing at least two seven-thousand-metre peaks just as the sun’s first rays lit their crowns. Howling winds tear across the tops of the peaks, whipping snow and ice crystals into the air and leaving them hanging like a fine veil for the sun to get caught in. I have always been a fan of the mountains, and Nepal remains one of my favourite destinations on the planet. Stupefyingly beautiful. I took this photograph in a small village that was being rebuilt by the NGO I work for after it had been destroyed by a cyclone. We were on Haiti’s Ile de la Gonave, a small island a short distance off the coast of the nation’s capital Port-au-Prince. While Port-au-Prince remains one of the world’s more unsavory destinations, replete with riots, kidnappings, political violence and general criminality- not to mention substantial poverty- Gonave couldn’t be more different. A laid-back Afro-Carribean island with friendly people and gorgeous tropical scenery laid out on coral-white rock and ringed by azure seas, the only thing that reminded me I was actually working while I was here was the fact that we spent eight hours a day rattling around inside a regulation Toyota Land Cruiser, on what I maintain are the very worst roads I have been on. Anywhere, anytime. And I decry anybody to find me a worse set. As we’ve already ascertained, I love mountains. So I’ve actually been pretty restrained in this collection by not just launching a whole ream of mountain photos at you. Though truth be told, as my photography skills (and equipment…) have improved, the amount of time I’ve had around mountains has sadly dwindled, an error which I plan to remedy as soon as I get the opportunity. And hardship it was. Quite aside from the powerful winds, the altitude was an absolute killer. We foolishly drove up from 2,000m to 4,500m in the space of ninety minutes, ignoring all calls for acclimitization. Then we hiked up past the hut at 4,800m, eventually tailing off around 5,200m just short of the start of the ice-cap. By the top, I was taking five paces, then stopping for two minutes to catch my breath. Then another five paces… We ended up coming down of the mountain fairly shortly after that, when my colleague began to complain of difficulty breathing. This woman was one of the villagers with whom the project was working, one of several who wanted to accompany us on our little excursion. I caught her in this brief moment of reflection at the mountain hut at 4,800m, and her bright clothes against the grey stone just stood out. I’m really fond of this photo. It captures something of the mountain spirit of these gentle people. She seemed right at home up there, on the edge of where people survive. The Flinders Ranges, in South Australia, capture for me the rugged beauty of the interior of this continent. Barren, dry, wild and isolated, they grab my imagination and make me want to explore some more. The five days that my brother and I spent driving around the southern part of the SA outback only whet my appetite. Such a beautiful country, right on my doorstep, sometimes I wonder why I spend so much time jetting away from it. But then I think there’s beauty wherever we end up in the world, we just need to learn how to see it. Certainly for those of us who’ve ended up here in Australia, we have no excuse to complain. It’s a pretty amazing country, really. Am I allowed to say that as a wandering Kiwi…?